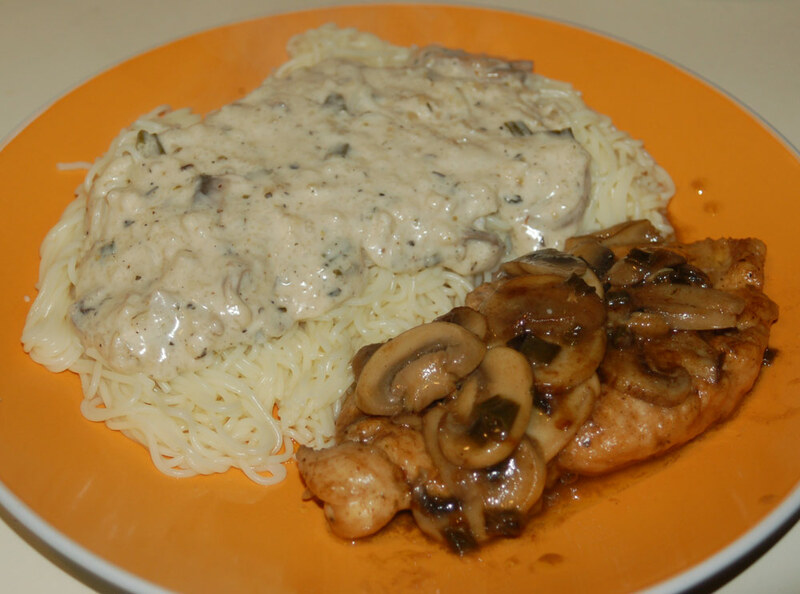 Chicken Marsala was a dish that my dad always used to order when we went to Italian restaurants. I never really had a taste for it up until a few years ago. Marsala being a Sicilian dish it was not one of the recipes brought over to America by my grandmother thus no one in my family ever cooked it. I did some researching of different recipes and put together my own that I find to be rather tasty, easy and as always well within the nuts and bolts budget most of us live on. Step 1: Prep Chicken – Cut chicken breasts in half long ways through the center of breast so that you are left with two thin cutlets. Beat each piece with a tenderizer. Take flour, ¼ of a cup or enough to cover each cutlet and pour into a mixing bowl. Add 1 teaspoon of salt, ½ teaspoon of pepper and 1 teaspoon of oregano and whisk together. Pat chicken in this mixture till it is completely covered. Step 2: Chop Vegetables and Cook Pasta – Chop all mushrooms and green onions, mince garlic. Boil water for pasta and cook it. 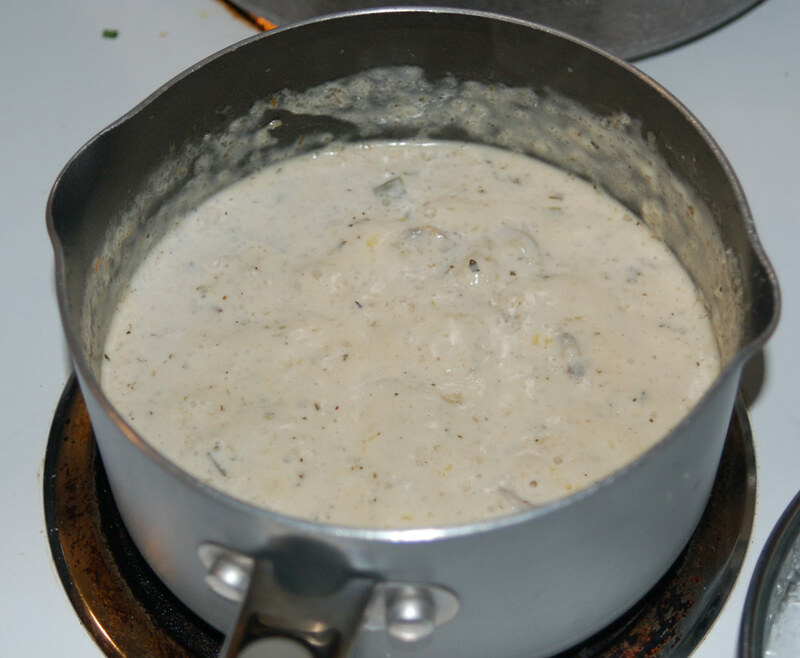 Step 3: Make Creamy Marsala Sauce – In a small sauce pot melt 2 table spoons of butter. When melted add 1/3 cup of heavy cream, 1/8 cup of milk, mushrooms, salt, pepper, oregano and Marsala wine. Bring to a boil, then reduce heat and let simmer around twenty minutes. Add green onions. After that create a roux to thicken sauce using 1/8 the amount of roux to sauce. Melt about ¼ of a tablespoon of butter in a separate saucepot. When melted add an equal amount of flour to it. Mix together and cook on high flame till you get a brownish blob looking substance. Pour half of your Marsala sauce into this pot with the roux and stir till both are well blended then pour back into the main Marsala sauce pot, stir well and let simmer on a low flame for five minutes. Turn off heat and let sauce stand another five minutes and sauce should thicken up nicely. Step 4: Fry Chicken – In a large frying pan melt 4 tablespoons of butter in 4 tablespoons of Olive Oil. 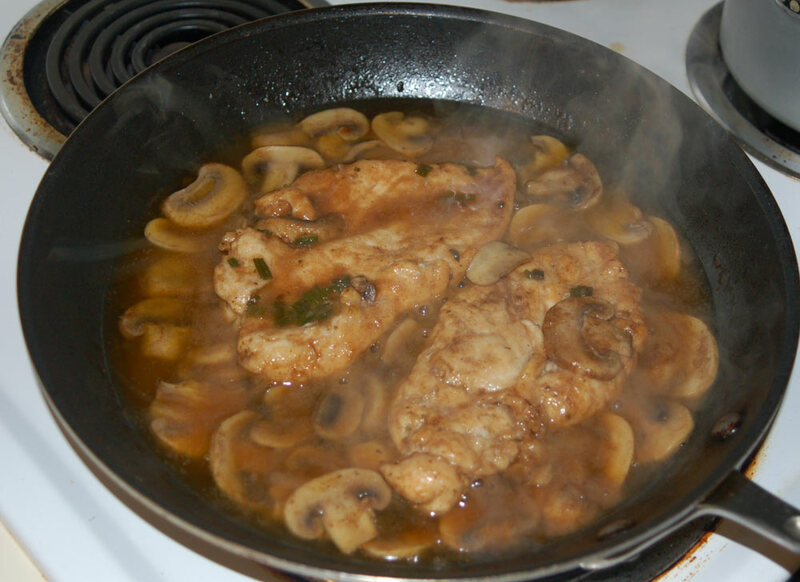 When completely dissolved add chicken and cook both sides till golden brown or 165 degrees F. Add mushrooms, sherry and Marsala Wine, Sautee till mushrooms are soft. Add green onion. Step 5: Put it all together – Take finished pasta and put it into a plate. Put finished Chicken breast and mushrooms on top of pasta. Pour sauce over all and enjoy! about the “Chris Lisanti loves to eat mushrooms unless they are the magic kind” I think we need a story. UCB?